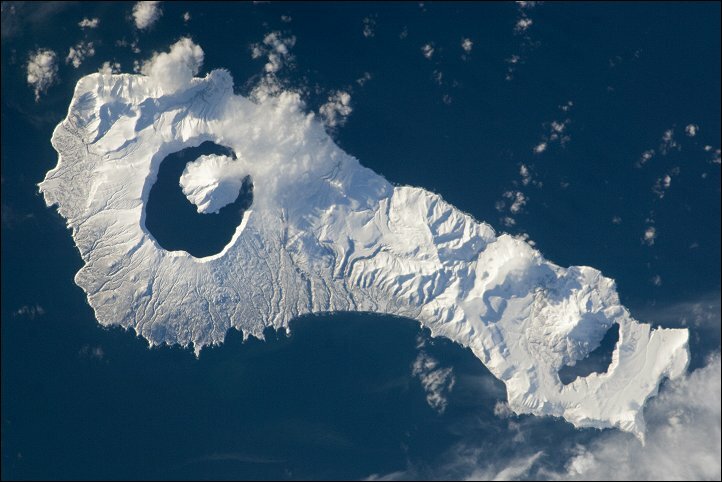 Snow cover highlights the calderas and volcanic cones that form the northern and southern ends of Onekotan Island, part of the Russia in the western Pacific Ocean. Calderas are depressions formed when a volcano empties its magma chamber in an explosive eruption and then the overlaying material collapses into the evacuated space. In this astronaut photograph from the International Space Station, the northern end of the island (image right) is dominated by the Nemo Peak volcano, which began forming within an older caldera approximately 9,500 years ago. The last recorded eruption at Nemo Peak occurred in the early 18th century. The southern end of the island was formed by the 7.5 kilometer (4.6 mile) wide Tao-Rusyr Caldera. The caldera is filled by Kal’tsevoe Lake and Krenitzyn Peak, a volcano that has only erupted once in recorded history (in 1952). 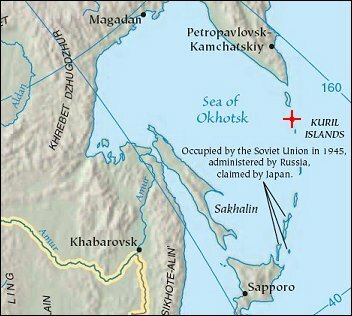 Extending between northeastern Japan and the Kamchatka Peninsula of Russia, the Kurils are an island arc located along the Pacific “Ring of Fire.” Island arcs form along an active boundary between two tectonic plates, where one plate is being driven beneath the other (subduction). Magma generated by the subduction process feeds volcanoes—which eventually form volcanic islands over the subduction boundary.